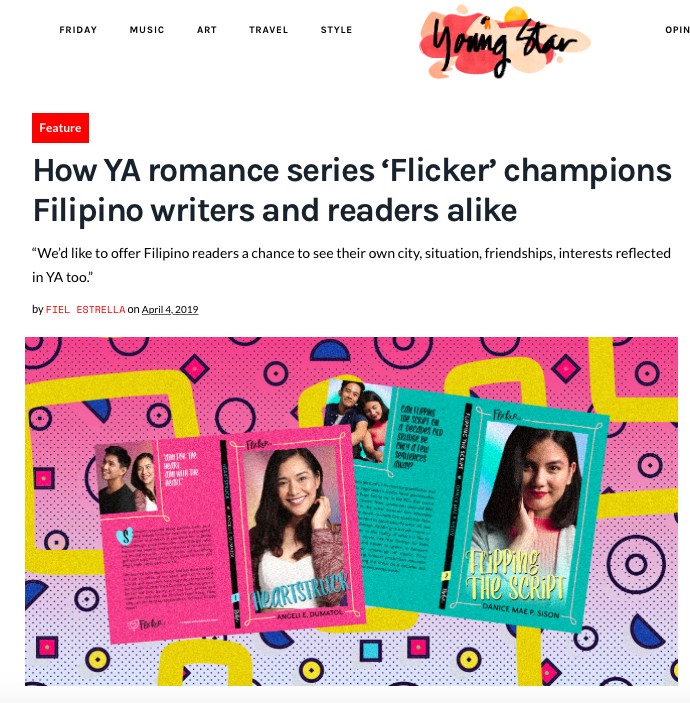 A fun thing happened –the #romanceclassYA project that became Flicker was featured in Young Star! Author Angeli E. Dumatol and I were interviewed by Fiel Estrella, and the feature went online earlier this month. I asked Fiel if I could post the rest of her interview on my blog after the article came out, because I enjoyed answering all her questions. So here they are. I tried not to include the ones already referenced in the article, but there may be some overlaps. Thank you, Fiel! Fiel: What process do the books usually go through? How are they and/or the authors selected, and what qualities must each Flicker book possess? Mina: The first batch of books were written during a 3-month online class. Ines Bautista-Yao and Agay Llanera wrote lessons, I sent them via email, and authors submitted assignments and then a completed first draft at the end of the class. Ines and Agay gave editorial notes on all submissions, which is a feat. Sometimes a revision note requires a lot of time to do; sometimes the draft is so close to ready. When it’s the latter, then the author gets an offer to work with the Flicker team…which means another round of edits, then a cover photo shoot, then a release day. After the first three selected books are released, we may just post submission guidelines, and not do a full class anymore. Hopefully reading the books published under Flicker is enough to give readers an idea what a future Flicker book could be and if they’re the ones to write it. Fiel: Let’s talk about Heartstruck. What made it the perfect title to start off and introduce readers to the series? Mina: Angeli Dumatol’s Heartstruck managed to capture what we were imagining Flicker to be about…and Angeli was first to send back her revised draft. It still took a year of revising, I’m told, and we’re very aware that all the authors we work with have other jobs and responsibilities. We all do! This is a hobby for everyone, and in this game of squeezing in time, Heartstruck was first. And it does have everything we were looking for. Fiel: That said — how would you describe Flicker’s brand identity and the typical Flicker reader? Mina: Through the books #romanceclass authors already published, we have some idea who our readers are. We see them at events, or interact with them online. The youngest are students, and they read a lot of international YA. We’d like to offer them a chance to see their own city, situation, friendships, interests reflected in YA too. Even just characters with familiar nicknames and last names. Fiel: I noticed that the cover of Heartstruck bears a resemblance to classic ‘80s and ‘90s teen romance novel anthologies like Wildfire. Was this an intentional effort to pay homage to them? Mina: Haha yes, for both Flair and Flicker we had an “imprint identity” designed. Flair (designed by Miles Tan) was inspired by category romance lines like Harlequin, Flicker (designed by Clarissa Ines) pays homage to Sweet Dreams and Love Stories. Again it’s about setting expectations, and we want readers to see another Flicker book and know they’ll get the same kind of feels. Fiel: Ultimately, what do you hope to accomplish through the series? Mina: Options for everyone. Options for readers, options for authors, and opportunities for the editors, artists, printers, photographers, cover models, stylists, makeup artists who become part of the process. Fiel: Growing up, when I tried to write original stories, they still had a kind of Western voice to them because I was used to reading American young adult novels. For you, how do we write authentic Filipino YA that we can really claim as ours? Mina: I don’t know if we have this figured out yet. What we’ve done is take a form that we recognize as Western and made very specific alterations to it, so it feels more comfortable. This isn’t just a Flicker thing, but I’ve seen reactions to romanceclass books, and sometimes an author can get an experience from a Pinoy high school, or community, or family so exactly right that the reader’s own experience feels like…yes, that happens to other people too. Maybe we start with that. Fiel: What’s the secret to a good YA romance? Mina: Sincerity, I think. I’m reading the Flicker submissions and by design the romance isn’t very physical, but it’s a lot of mind and heart and intentions. Sincerity and trust matter so much. Mina: Flipping the Script by Danice Sison, about Pinoy showbiz family rivalries and filmmaking. Also, Raya and Grayson’s Guide to Saving the World by Catherine Dellosa, about comic books and fandom. Fiel: Since its inception, #romanceclass has really brought a lot more options for readers who want to experience and support quality Filipino romance writing in English — not to mention helping writers find their voice and put out their work independently. Was this always your intention? How important is it to you to continue bringing variety and more choices to local readers? 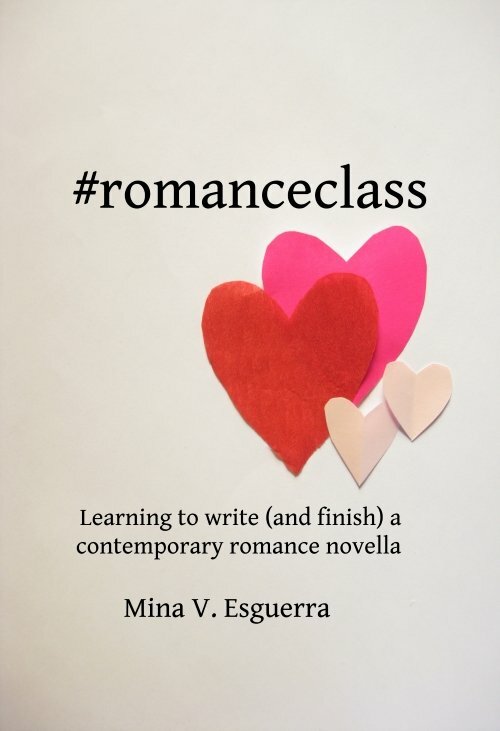 Mina: That wasn’t always the intention; I started #romanceclass because I thought it would be fun. (What’s more fun than talking about romance for MONTHS?) I was also used to workshops where the point was that you took it, and it’s okay if you produced a publishable work or not. But then after the first class we suddenly had a dozen published books, and the authors continued writing and publishing, and more classes led to more books and new authors…so now, yes, we do all the things to help each other out. That includes reading the books, providing feedback, setting guidelines so we can diversify the stories but maintain readers’ expectations, organizing events so we can introduce the books to new readers. Fiel: Why do you think it has succeeded and continues to thrive? Mina: We continue to be readers of the books we make, and because of that, are able to recommend titles to other readers. It works when you see that readers can pick up a book by one author, based on how they like a book by another author. It works when you see authors reading and recommending romanceclass books too. Reviews, recommendations, discussions also clue us in on what needs work, where the gaps are, and how to make upcoming books better. We’re in that stage now, identifying what’s missing and actively encouraging authors who are ready to write that story. Thank you for the opportunity to talk about romanceclass and Flicker! Get Heartstruck at bit.ly/Heartstruck and Flipping the Script at bit.ly/loloikong.